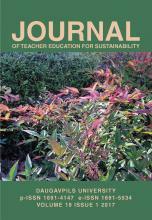 Since May 2007, the title of the journal is the Journal of Teacher Education for Sustainability (JTEFS) that emphasizes the unique orientation of the journal and helps to mark the journal's special niche among other journals for teacher education. Since 2007, two volumes of the journal are issued annually in spring (May-June) and autumn (November-December). December 15 and June 15 are deadlines for submitting the articles for spring and autumn volumes of journal. We have successfully completed the first stage of journals' development, when the authors have tried to create different models how to integrate sustainability, sustainable development, education for sustainable development, and sustainable teacher education in their own peculiar research topics. As it was emphasized in UNESCO network meeting in Helsinki, May 2006, the new phase of work is just started - UNESCO Guidelines for Reorientation of Teacher Education to Address Sustainability have to be implemented in practice. Therefore, journal strives to publish the articles reflecting the research on bridging the intents, theory, and practice. The development of the theory is not yet fully accomplished and JTEFS will publish any valuable proposals in this regard, however, the priory will be given to the applied research based on ideology of action research and qualitative changes coming from the research. Editorial Board of journal encourages the authors to read the UNESCO Guidelines before they conduct the research aimed for the submission for the reviewers of JTEFS. If you have any doubts about the appropriateness of your article for JTEFS, please, send the abstract or brief summary of idea (at least month before the submission of article) to the editor of JTEFS. The journal will be of special interest to teacher training institutions and to those working on them. Target groups of the journal are members of staff (both teachers, administrators and researchers) working with teacher training and education matters, school administration, school teachers and other experts in the field of education. Master and doctoral students are also among the groups the journal intends to reach. Psychological aspects of teachers' work, etc. Other themes associated to the above or emerging ones will also be considered. Critiques of previously published papers or books, etc. UNESCO/UNITWIN Chair at Daugavpils University. LV – 5401 Daugavpils, Latvia.